12 August 2013. Add Ukraine, remove Belarus. While some server sites are known NSA-Echelon spy stations of the Five-Eyes -- US, UK, CA, AU and NZ -- many of the server sites are shown at, or near, national capitals. 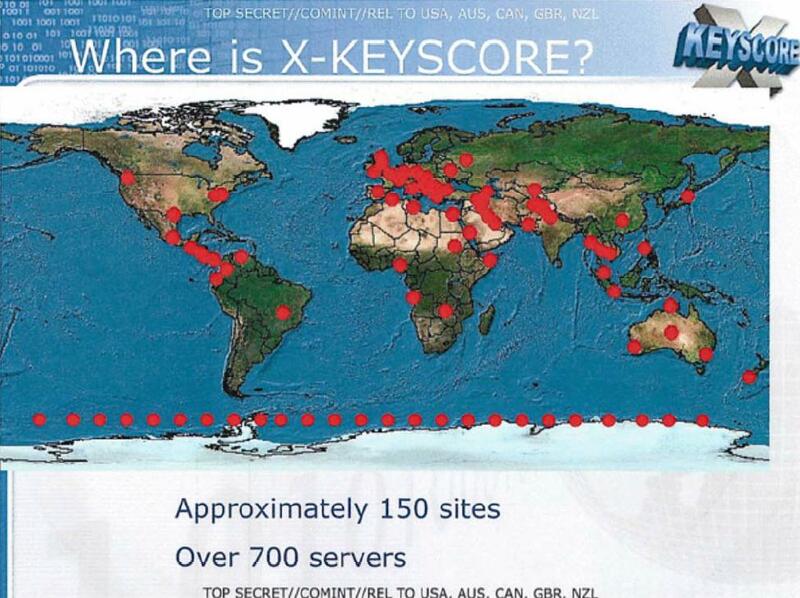 These may be symbolic locations or, intriguingly, may indicate X-Keyscore servers at US embassies. A surprise is the dot at Moscow. Another is a site shown in south-central China, far from Beijing, located nowhere obvious (a long-shot: it's a covert server). The NSA station in Hawaii where Edward Snowden worked is not shown on the map. There are about 85 red dots on the site map which claims "approximately 150 sites," with 25 of the dots along the Antarctica coast. Dots appear to be shown in 51 countries, plus seemingly circumscribed Anarctica. The densest concentration is in Europe, Middle East, South Asia, Central America. But none shown in top of the world, CA, NO, SW, IS, PT, most of South America, the Pacific and Atlantic islands, a slew of others.